The nature of most backyard ponds means that plants cannot be simply planted in the ground as they normally would. As most ponds are lined with heavy duty liners that make traditional planting impossible, any pond plants need a special source of soil in which to anchor. Setting your pond plants in a convenient, durable planter basket is the perfect solution, giving your pond plants a place to thrive while also making it a cinch to position and reposition them within the pond as you wish. Pet Mountain's Pond Plant Basket store features top quality products from the most trusted names in backyard pond care, including Tetra Pond and Beckett. The Tetra Aquatic Planter Basket is a plastic planter basket that's ideal for the growth of water lilies. 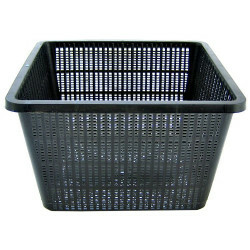 This durable and easy to implement basket allows water and nutrients to reach the roots of your aquatic pond plants and grow to their full potential. Tetra Pond AquaPlanters make it easy to plant in your pond! 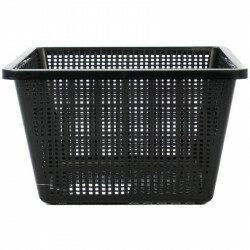 These flexible bottom planters prevent spilling from tipped plastic baskets. Perfect for narrow places as they can form to different locations. Water and nutrients can also pass through and get to the roots of your plants. The Beckett Round Plant Pond Basket secures and protects your aquatic plants, with open screen sides and bottom to allow roots to flourish while staying protected from damage by fish.